How can coaches get the most out of social media? Coaches and social media. While it’s a topic that is often dominated by negativity, we think social media is something coaches should embrace. While there are risks, they are certainly outweighed by the benefits. From recruiting to fan engagement, owning your message to media attention, social media is something that, if used intentionally, can be an asset for a coach. We recently partnered up with the America East Conference for part of their 3 Pillars Academy, where Fieldhouse Media founder Kevin DeShazo chatted about how coaches can use social media to their benefit and why it matters. 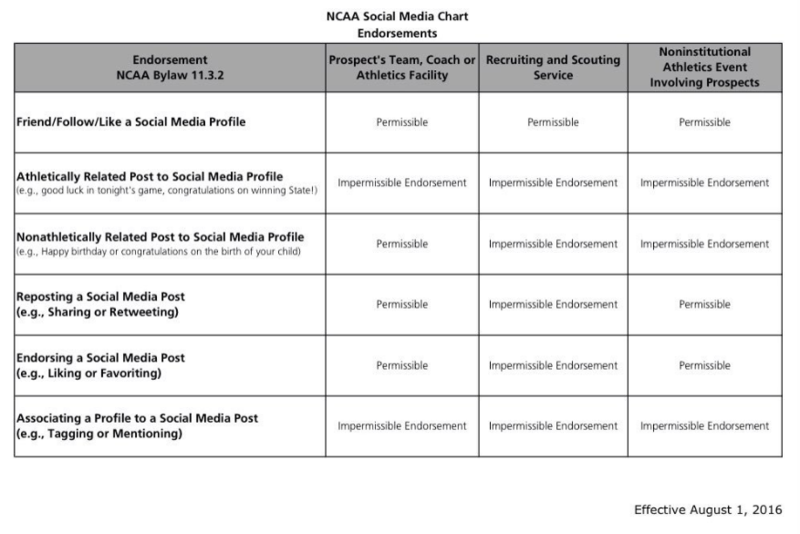 Make social media training a priority for your student-athletes and staff. They won’t become great at it on accident. Our spring semester calendar is filling up quickly. For information or to schedule a session, email us. Fieldhouse Media is an award-winning firm dedicated to helping athletics departments get the most out of their social media efforts, from educating student-athletes and staff to providing an overall strategy. To find out more about us or to join the more than 180 schools utilizing our services for their athletics department, contact us today. Yesterday was quite the day. Without going into the full details (USA Today has a good recap here), the rundown is that Tennessee was rumored to be announcing Greg Schiano as their new football coach on Sunday afternoon/evening. Schiano is the current defensive coordinator at Ohio State. 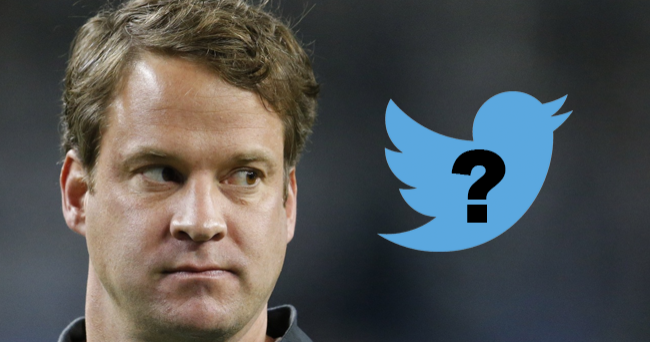 As soon multiple outlets confirmed that report, Twitter came to life and eventually, reports have come out stating that the hire will not happen. Schiano’s name came up in the Sandusky scandal (he was a GA at Penn State at the time) and Tennessee fans on Twitter were not happy. Tennessee legislators and local businesses even got in on the Twitter action, demanding the Vols go a different direction. Our Tennessee standards mean something, and a Greg Schiano hire would be anathema to all that our University and our community stand for. I sincerely hope that these rumors are not true, because even serious consideration would be unacceptable. Greg Schiano is not allowed in our establishment. The White House Press Secretary even got involved. There’s a lot to break down here and we’re just going to scratch the surface. It’s easy to dismiss social media chatter as “fanatics” who don’t have a real impact on your program. And there is certainly some truth to that. We have often said that the great thing about social media is that it gives everyone a voice. Also, the terrible thing about social media is that it gives everyone a voice. But this went beyond that. This went deeper than message board conspiracies to media members, businesses (potential sponsors?) and state politicians. Protests on campus were organized, the online mob grew louder, John Currie (AD at Tennessee) had his phone number (both office and cell) and email address posted to Twitter. The situation became so toxic that both parties disengaged. We talk often about social media being used as a tool in the hiring process, but the story that isn’t often told is the power that fans now have. With social media, those voices (positive or negative) spread quickly. It becomes a snowball that grows larger and larger as it barrels down the mountain, taking out whatever (and whomever) gets in the way. And this time, what got in the way were a coach (and his family), an athletics director and athletics department. AD’s have to not only have the pulse on their department, but on the fan base. With social media, fans are going to find every potential red flag a candidate could have. ADs and search committees no doubt do the same due diligence. Then they weigh whether those red flags are something they can overcome and “win” in the press conference and on the field/court, or if they’re enough of an issue to pass. 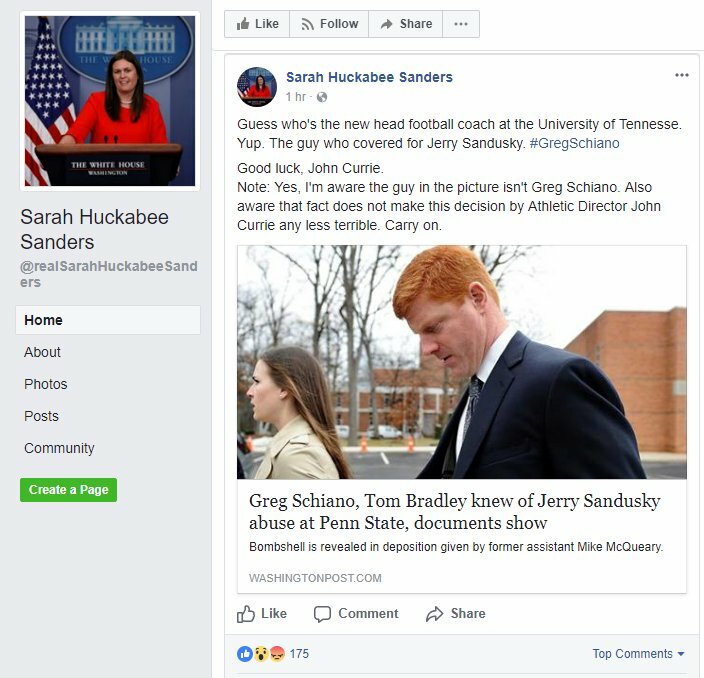 Tennessee believe this to be the former (and I’m not here to place judgement on whether Schiano should or should not have been hired). *FWIW, Dan Wetzel covered the Penn State scandal as well as anyone and had this to say about Schiano’s involvement (or lack thereof) and the chaos that went down yesterday. The problem is that they completely missed. They missed on how their fans would react, on how quickly the firestorm would last and on just how toxic the red flags were. They missed how influential social media can truly be. The outcry became digitally deafening. And it was enough of a crisis to cause an athletics department to back out of their decision, to change course. A coach was fired before he was every officially announced as hired. Where we go from here is yet to be seen, but it certainly adds significant pressure to the already pressure-packed position of being a college athletics director. Yesterday, the full power of sports fan Twitter was on full display. Whether that’s good or bad is yet to be determined, but today is one that will be talked about for years to come. And it’s certainly something we’ll discuss on our panel at the NCAA Convention in January, where we look at What AD’s Should Know About Social Media. Fieldhouse Media is an award-winning firm dedicated to helping athletics departments get the most out of their social media efforts, from educating student-athletes and staff to providing an overall strategy. To find out more about us or to join the more than 130 schools utilizing our services for their athletics department, contact us today. We are, without question, living in interesting times. From #NeverTrump to #CrookedHillary, Russia news to #FakeNews, #BlackLivesMatter to #AllLivesMatter, our waves of communication (TV, internet and personal) are rife with tension. Everyone has a voice, everyone has an opinion, everyone has a platform to shout it from. So, what about student-athletes? Coaches want to eliminate “distractions” and want the players focused, but we need to acknowledge that it might be tough to focus completely on their sport when they see what’s going on in the world – good and bad. Today we have a guest post from our friend Morgan Crutchfield. Morgan is a writer and photographer who studies the dynamics of social media and sports. Find her on Twitter @CentralMorgan. Enjoy! Social Media can be a scary thing to tackle as a coach; the need to address athletes’ social media usage may be overwhelmed by fear of failure to cover all the issues or intimidation related to opening a Pandora’s Box by talking about social at all. Attempts to create guidelines start to look like exercises in making long lists of don’ts and the ever-changing landscape of apps and platforms seems to create more work and more room for error. But as we learn more about athletes’ relationships with their teammates and peers, we’re learning that a restrictive social media plan is not only not effective for teams, it fails to capitalize on the power of positive social. While there is certainly value in setting boundaries with your players and possibly even providing examples of social media disasters to prove the point, educating on what not to do should only be a small part of the plan. Because while social media can be a gateway to some exceptionally negative consequences for athletes who use it only as a megaphone for poorly thought-out posts, it can also be an incredibly powerful set of tools to help athletes build both team unity and self image. Where should you start? Like any skill on the field, wise social media use starts with practice, so I’ve developed a “drill” that will help your athletes understand how to use social media for good and at the same time will utilize the networks they’re on for hours at a time . When we are on campus doing social media education sessions with student-athletes, we also do sessions with coaches and staff. Part of that is to better equip them to have meaningful conversations with their student-athletes about social media use, and part of it is to help them understand how/why they should be active on social media. Slowly but surely, coaches are coming around to the idea that it is beneficial for them to be present on social media. For those who work in social media this seems like a no-brainer, but for many it is still a tough thing to embrace. Student-Athletes have a lot of critics. From fans to media to opponents, even parents and coaches can, at times, be critics. It seems everyone has an opinion on what they should do. When it comes to shaping behavior, what they really need are models. Critics tell them what not to do, while models show them what to do. Critics call them out, models call them up to what they’re capable of being. At practice, coaches spend a significant amount of time reinforcing good technique, good habits, good decisions. If you continually tell a player to not drop the pass, they end up focusing so much on not dropping the pass that, of course, they drop the pass. There’s so much tension and anxiety around not screwing up. Instead, we coach them on what needs to happen in order to reach the desired goal of catching the pass. We focus on good route-running skills, timing and proper hand position. When they drop it, we step out and show them how it’s done so that they can see it. They can visualize it. We model the right way to do it. Then we send them back out to practice it over and over until it becomes second nature to simply catch the pass. The fear of dropping it is no longer there. When it comes to social media, too often we are doing the exact opposite. We are coaching them on what not to do, continually criticizing their poor behavior and decisions. We bring in speakers who are unfamiliar with social media, who only know the negative side of it and try to instill in them a fear of messing up. We have coaches who don’t use the platforms preaching that same message. They only thing they know about social media is what not to do. When that’s all you are focused on, you are bound to slip up. 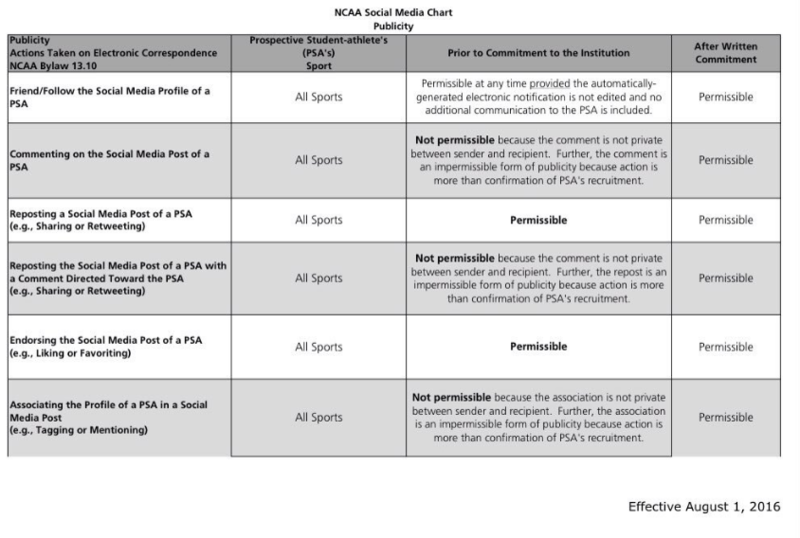 What student-athletes need on social media are models. Someone to guide them on how to use social media well, to help them develop goals for their social media use. Leaders who can explain what that looks like and why that matters. Someone who uses it often and can show them how powerful social media can be when used with a purpose. They need coaches, staff members, people in the community and business world to follow online who can show them what it means to use social media for more than just talking to your friends. People they can learn from and model their social media behavior after. As educators, it is our job to model. To preach purpose over fear. To prepare them for success online. We have the opportunity to shape how they view and use social media. Are we taking the best approach? To quote John Wooden, “young people need models, not critics.